Long before Kelly Slater was picking up World Champion titles for his surfing prowess, the sport was being followed by Hawaiian natives in the 19th century. And now the first ever picture of a surfer has been found in a photo album that dates back to 1890. 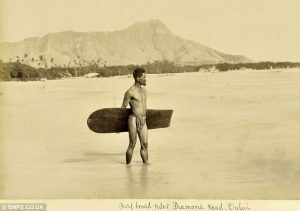 The muscled Hawaiian beach boy is photographed wearing a traditional loin cloth and shown standing in the shallows holding his rudimentary board. Missionaries who went to the island after Captain Cook’s death there in 1789 virtually stamped out all surfing in Hawaii because they thought it ungodly. It survived in small pockets and this strapping surfer was clearly keeping up the tradition and the picture has survived and is now up for sale. Two albums full of snaps have been submitted for auction and other subjects include pictures of …. 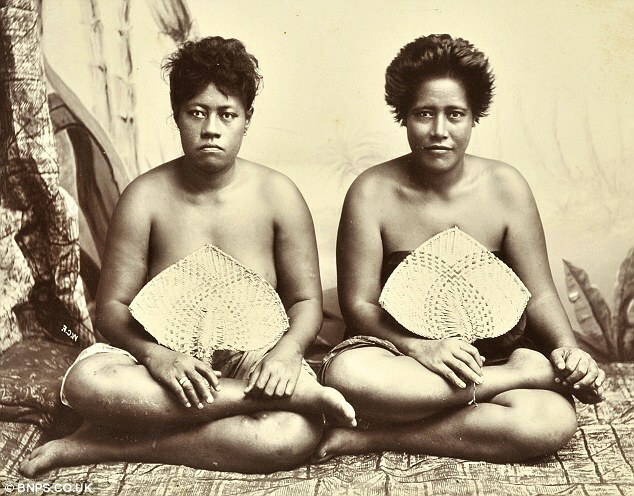 native women from Hawaii and Fiji – and the pre-sale estimate is £10,000…. In total there are 100 photographs, 20 from Fiji, and they record the characters and scenes that Britons found so intriguing to look at. Chris Albury, from Dominic Winter auctions near Cirencester, Gloucs, which is selling the albums on Thursday, said: ‘These are very interesting albums. ‘And what does stand out is the photograph of the surfer which we think was taken in about 1890 and is one of the earliest photos taken of a surfer…. I was blessed to be able to take trip to Hawaii in my early twenties and there an Aboriginal brother taught me to surf. We reasoned over many things, King Khamehameha, American colonialism. He new everything about Jamaica. I love reading of the truth about Hawaii. Its just sad that the white man has done a job of teaching these beautiful Black people who they are not. For getting who their ancestors really are. I agree. They have been lied to. They are beautiful dark skined and curly hair people. I love this site, shows the truth.